The Old Style is a stand alone beach house just steps from the sand as seen above. 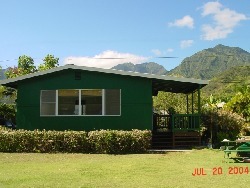 It is called the Old Style since it was once the old vicarage house of the Wai'oli Mission. There is lots of light, great views & a very restful feeling. Single wall redwood was the preferred building style back in the day. It is beautifully painted to accentuate the style of the time. The floor plan is open to enjoy the living dining & kitchen areas while taking in the views. There is a full kitchen for cooking up island fish & fare and other tropical treats. The bedroom is cool and comfortable with a king bed. In the living room are two punees or day beds that could accomodate children in addtion to the couch. The lanai is a fabulous place to relax at the end of a hard day lounging around on the beach or discovering more of Kauai. 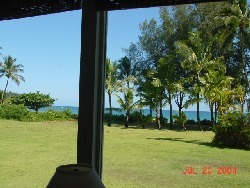 You are about 4 blocks to Hanalei town with its cool shops and restaurants. Nice walk home after dinner. There is a washhouse on the property with 2 sets of coin-op wahsers & dryers for your laundry needs and a hot & cold outside shower for after the beach. Folks love this house & we have many returning guests. You can be here too. Aloha!